increased positive brave wave (i.e. delta, alpha, theta and low beta) activity associated with deep relaxation, healing, dreaminess, auto-immune improvement & neuro-endocrine function. By combining music with Denise’s outwardly voice (during the concert she was joined by Tom, her stepdaughter & a violin player) singing in sanskrit syllables & frequency, we got immersed into the healing modality that quietens the mind down & makes you see the world clearly & in perfect colour. Even Denise own disposition has changed during her singing, as she radiated a child-like innocence, somewhat fully immersed in the natural beauty of the moment. Surrounded by cooling & healing walls of Fitzrovia Chapel, the audience fully engaged with Denise, some silently, some echoing quietly her singing. Some sat with eyes closed, others drank the atmosphere in with eyes wide-open. When the last sound vibration evaporated into the atmosphere, it left behind pure, positive energy, that seemed to have multiplied exponentially. 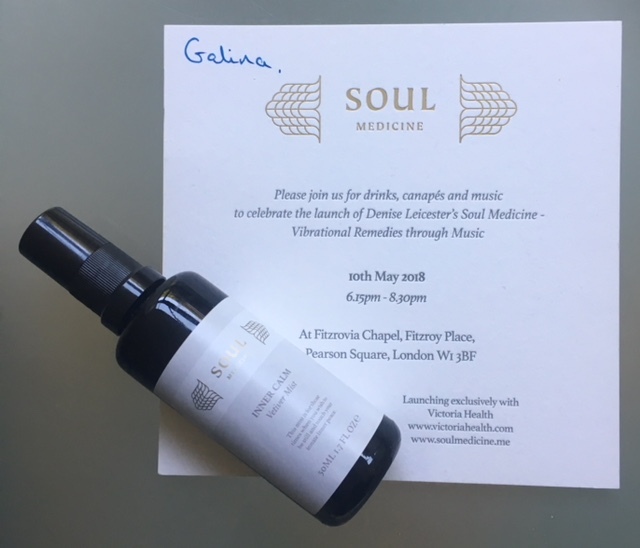 Soul Medicine launched with four tracks, each with a clear explanation of their intended benefits. Easy to download, listeners can match their needs with the appropriate vibrational remedy. Being Held is recommended for deep relaxation & to aid sleep. It is also prescribed to help through a period of grief or for those who have experienced trauma. Being Present is prescribed during a period of illness & to help build resilience. Being Loved awakens loving qualities such as patience, kindness, truth, healing, sweetness, forgiveness & vulnerability, focusing on the Sanskrit sound ‘ma’, the healing syllable known as the Hridyaya. it is a very pure & sacred sound that awakens qualities of love, such as patience, kindness, truth, healing, sweetness, forgiveness & vulnerability. I was completely transfixed by the beauty of this track during the ‘live’ performance & still struggle to put it into worlds, such was its potency & emotional vibrancy that seeped into the body & made me feel comfortably cocooned in the loving embrace. Being Lifted is prescribed to lift mood especially at times of hormonal change. To enhance the sacredness of the space where you listen to the tracks, Denise has created two mists to enhance the listening experience. Inner Calm, a vetiver meditation mist & Inner Smile, a jasmine meditation mist. I have been trying Inner Calm during my meditation practise & its effect is more powerful, possibly due to the concentration of ingredients enhanced by Denise’s skill as therapist & formulator. Having had the privilege to experience the ‘live’ performance, I can only say that it touched every person in the audience. We all ended up hugging each other, reflecting, sharing, smiling, laughing. We basked in the serene atmosphere and the gratitude glow from the music that touches heart, soul & mind in an unseen, but deeply profound way.